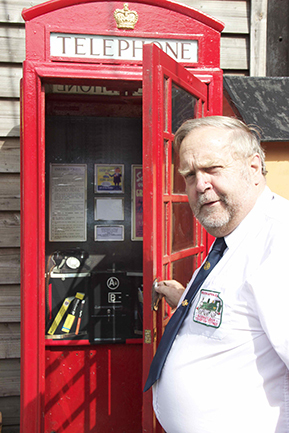 As part of its drive to upgrade facilities across the site the South Devon Railway has now installed modern telephonic apparatus in its red call box outside the main platform gate at Buckfastleigh. Today, Thursday 05 September, duty booking clerk John Keohane took a break from selling tickets to test the new system, making a call to Totnes Littlehempston station where a similar set of the new equipment has also been installed. We don't know whether he ended up pressing button A or B! 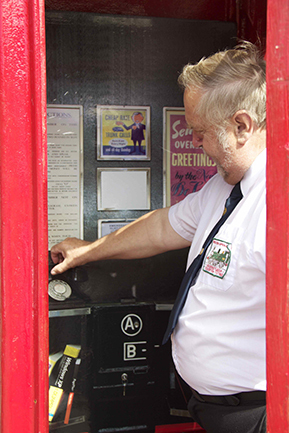 The K6 Telephone kiosk was given to the Railway by a London Group member in 1996 when it also had a BT payphone installed but the growth in mobile ’phone ownership made this uneconomic to keep. The SDR’s K6 or “Jubilee” telephone kiosks.